Logan, Utah — Utah State University (USU) hydrologists are revolutionizing the way scientific data is stored and shared among scientists around the globe. 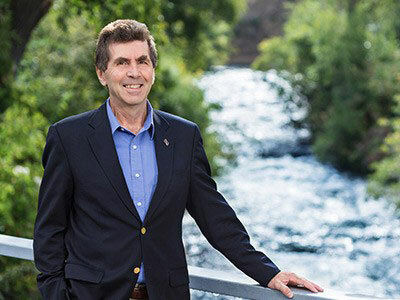 USU’s David Tarboton will lead a $4 million National Science Foundation-funded collaborative effort aimed at improving HydroShare — an online database system that simplifies the storage and sharing of hydrological data and models. Tarboton says sharing scientific data helps researchers collaborate and improves the quality of data and scientific knowledge. Enhancing HydroShare’s capabilities, he added, will help hydrologists and a broad community of earth-science researchers transform data sharing techniques and accelerate the pace of discovery. Improvements to HydroShare include enhancements to data sharing tools, and new features that enable its 1,000-plus users to develop their own unique apps to access HydroShare resources. HydroShare will play an important role in understanding the devastating flooding events from Hurricanes Harvey and Irma. Tarboton and collaborators at The University of Texas at Austin will use HydroShare as a key resource for understanding how such large and sustained flooding and rainfall events could have occurred, and how critical infrastructures should be designed to better withstand extreme weather events. Tarboton and Dr. Shaowen Wang (University of Illinois) and Ray Idaszak (University of North Carolina at Chapel Hill) are the principal investigators overseeing three collaborative NSF grants totaling $4 million. USU’s grant is for $2.76 million. Wang’s team will focus on innovating cyberGIS (geospatial information science and systems based on advanced computing and cyberinfrastructure) capabilities to advance geospatial big data and computing frontiers of the next-generation HydroShare. Idaszak’s team at UNC’s Renaissance Computing Institute, known as RENCI, provides data management infrastructure and development expertise. Other investigators include Dr. Jeff Horsburgh (USU), Tony Castronova and Martin Seul (Consortium of Universities for the Advancement of Hydrologic Science, Inc.) Jon Goodall (University of Virginia), Martyn Clark and David Gochis (National Center for Atmospheric Research), Alva Couch and Richard Hooper (Tufts University), Bart Nijssen and Christina Bandaragoda (University of Washington), Dan Ames (Brigham Young University), Yan Liu (U. of Illinois), Chris Calloway and Hong Yi (UNC RENCI) and Alisha Sarang-Sieminski (Olin College).